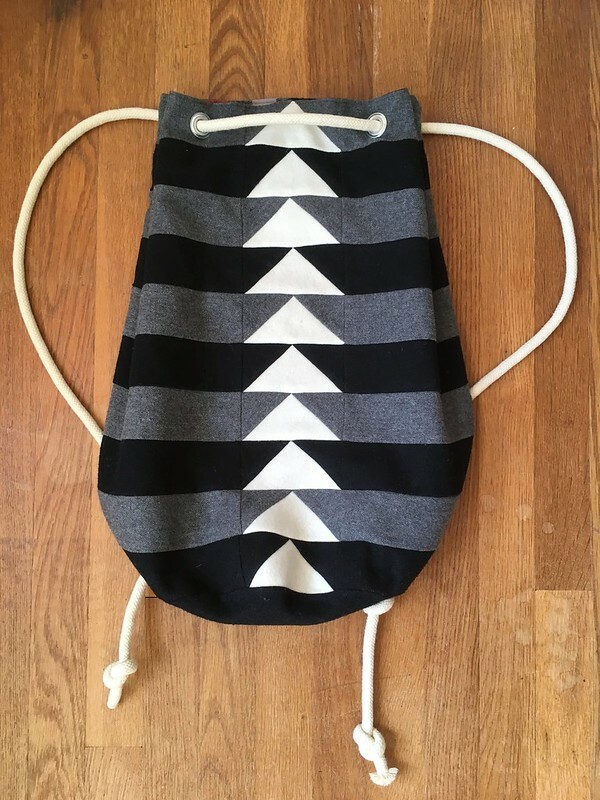 I have something a little bit different from what I normally sew for you today—a bag! 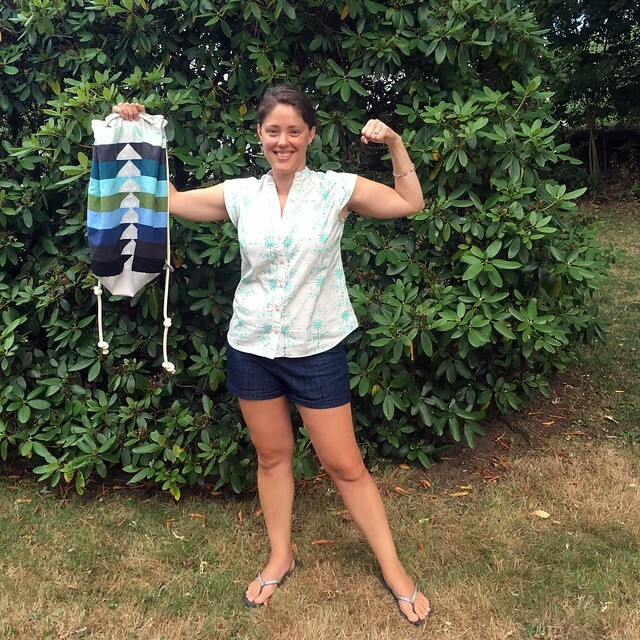 This is the Flying Geese Patchwork Bag designed by Giuseppe Ribaudo for the Bernina blog. 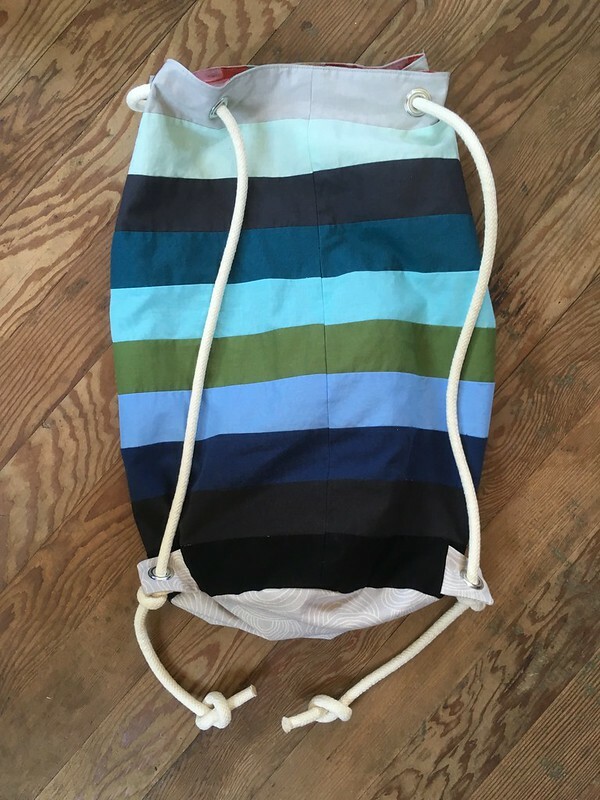 I made a summer version of this bag that I love and used daily…until recently. 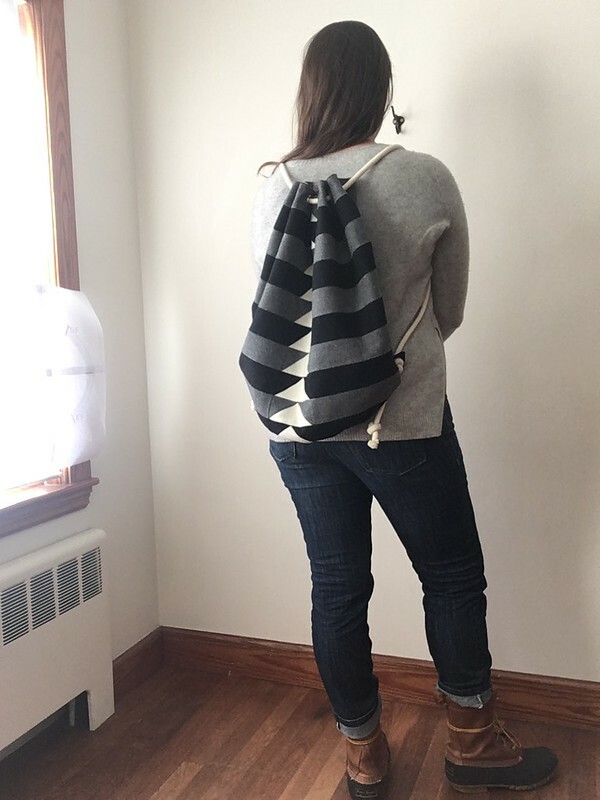 I had already been thinking about making a winter version of this bag in wool, since I had both black and gray wool sitting in my stash, but when Maggie at Pintuck & Purl asked if she could put my bag on display in her new shop window in North Hampton, NH along with a number of other staff and customer projects, I knew it was time. Actually, when she asked, my initial reaction was, “No way! 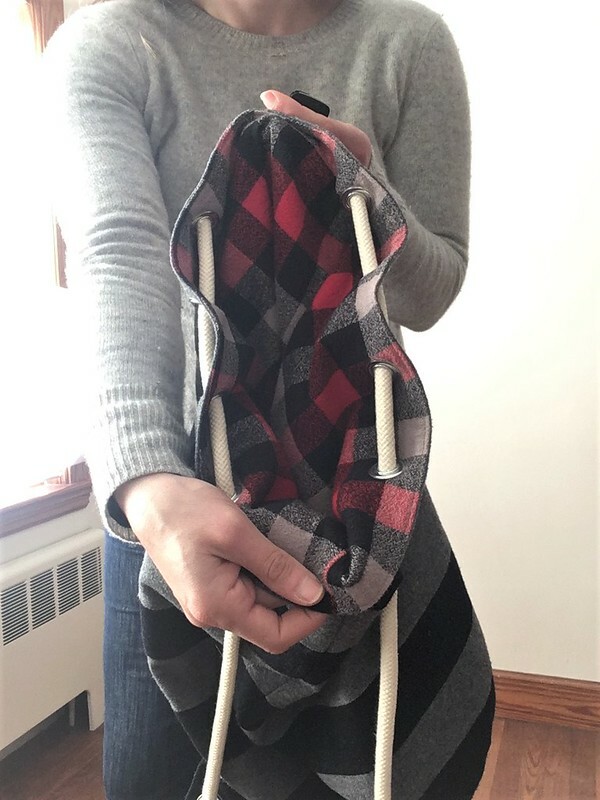 I use that bag every day!” Luckily, that part stayed in my head, rather than coming out of my mouth. My husband pointed out that it was an honor I would be sad to pass up, and after considering his wise words, I agreed. It was also the push I needed to make my winter version…before the end of winter. So here we are! I did it, and I LOVE it! If you have some sewing experience, I think you can make this bag with the information provided. I’m not a quilter or a bag maker, so I had to read the directions carefully to make sure I got everything right. I actually printed them out and made myself a little instruction packet I could mark up. 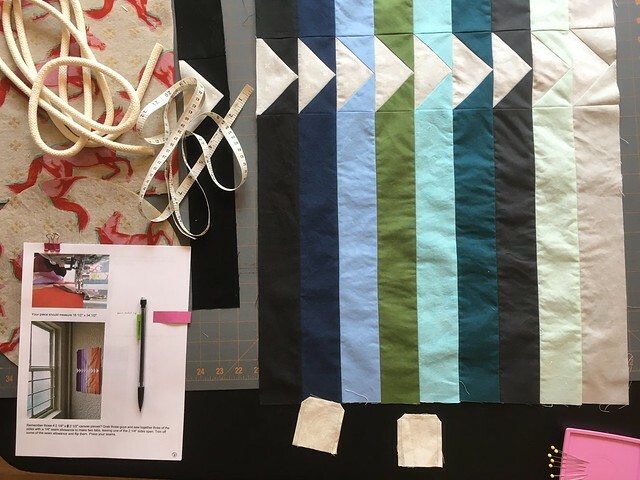 There are a few things that, as a non-quilter, I found a little bit confusing or unclear. This meant I had to call my emergency quilting hotline (my Mom) for help. 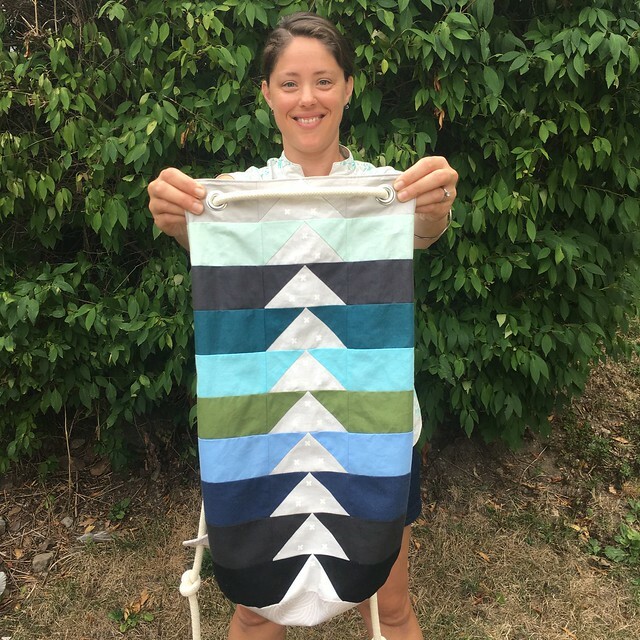 So this is for anyone who isn’t already a quilter or just wants some extra tips. A good thing for non-quilters need to know is that this bag is sewn with quarter-inch seams throughout, except where noted. Grainline doesn’t seem to be a consideration here. I think as long as you cut your strips on the straight grain or on the cross-grain, you’ll be good. It’s also important to note that quilters don’t always backstitch at the beginning and end of each seam. I couldn’t bring myself to do this. I kept thinking that this bag had to be durable and able to take weight, so I backstitched everything. I also wasn’t sure how to press my seams—open? to the side? In the end, I pressed them to the side. I could really tell on the flying geese (the white triangles) when I had pressed in the best direction (up, toward the top of the triangles worked best for me) because they looked crisp. Probably, though, it didn’t matter so much anywhere else. I also added a little bit of interfacing to the bottom tabs of the bag where the grommets will go, just for a little more strength. 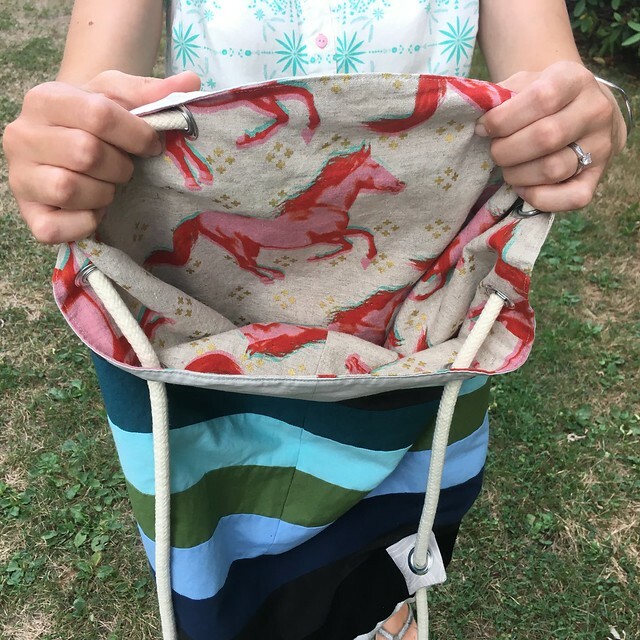 In addition, I stitched twice around the bottom of my bag (outer layer and lining) both with a quarter-inch seam allowance and a 3/8″ seam allowance. Maybe it’s not necessary, but it makes me feel better. There were a few more minor spots where I was confused, but I figured them out. If you make this and find yourself confused, feel free to leave a comment and I can tell you what I did, if that would be helpful. Above is a picture of the bag empty, so you can see the design. Below is how it looks with things inside. The design is more obscured, but still cool. The template provided was great as was the link to the tutorial on foundation paper piecing by Jennifer Mathis. I watched it a few times to make sure I was getting everything right. I also appreciated the detailed instructions on where to place the grommets. 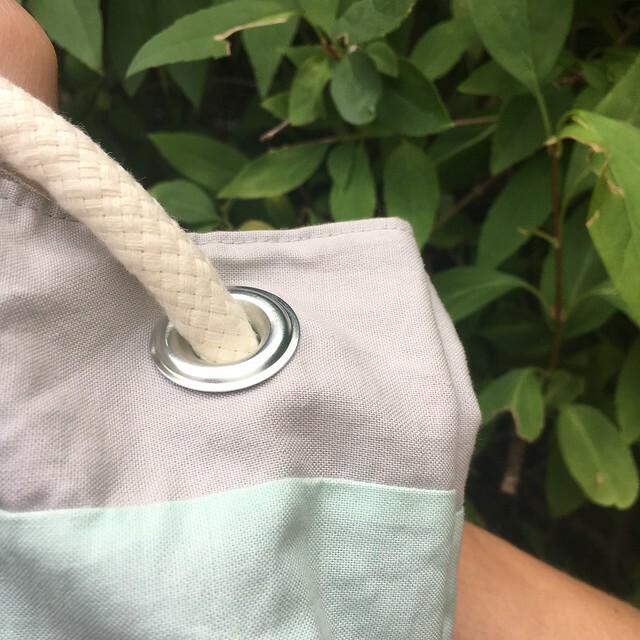 The photography in the bag tutorial is gorgeous, which got me really excited to sew this, and the end product—the bag—is beautiful AND functional—win-win. The black wool and gray wool were from my stash, but the white wool came from Pintuck & Purl. Also, unlike many people, I prewash my wool in hot or warm water and dry it in a hot dryer whenever I think I can get away with it so that I can wash it without fear of shrinkage going forward. The flannel was a Mammoth Flannel from Robert Kaufman Fabrics, bought at Pintuck & Purl. Grommets, rope, and interfacing came from JoAnn Fabrics. 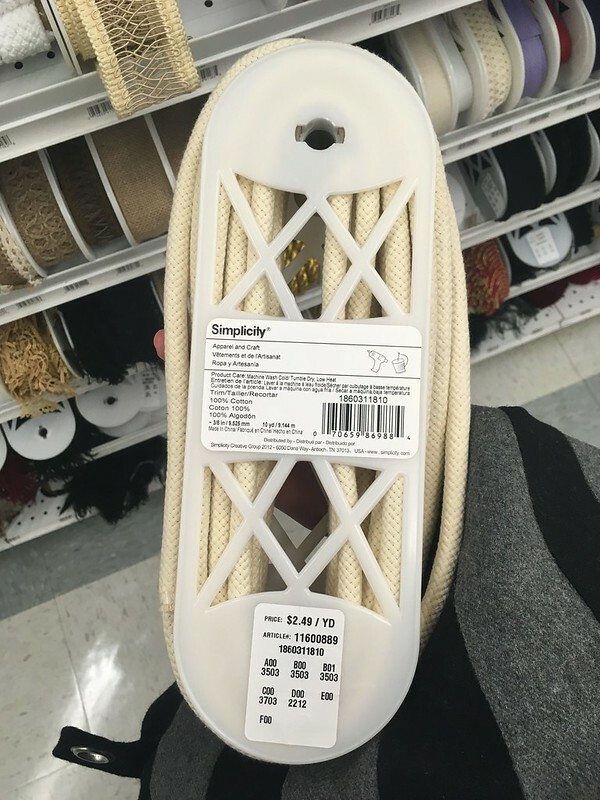 I couldn’t find the rope, which is Simplicity brand, in every JoAnn’s. I had to got to one of the larger stores for it. I found it in the trim section. This bag was totally worth the time away from garment sewing. I use it every day and really love it. That being said, I’m ready to get back to sewing clothes. Have any of you tried making this? Do you plan to? If you’ve made it, let us know in the comments! And now for something completely a little bit different. 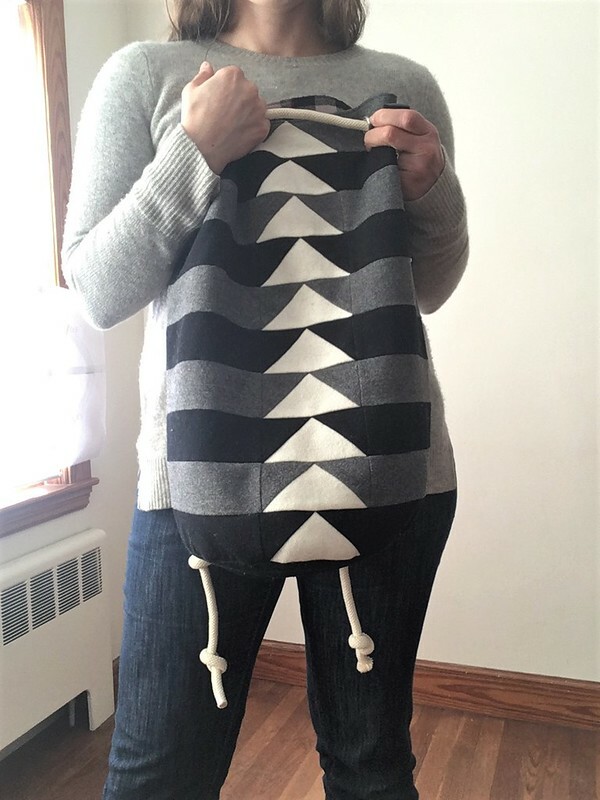 I sewed a bag! So…still sewing, but not my normal apparel sewing (although I do get to wear it!). I’ve seen a lot of cool bag patterns out there, but I never dove in. 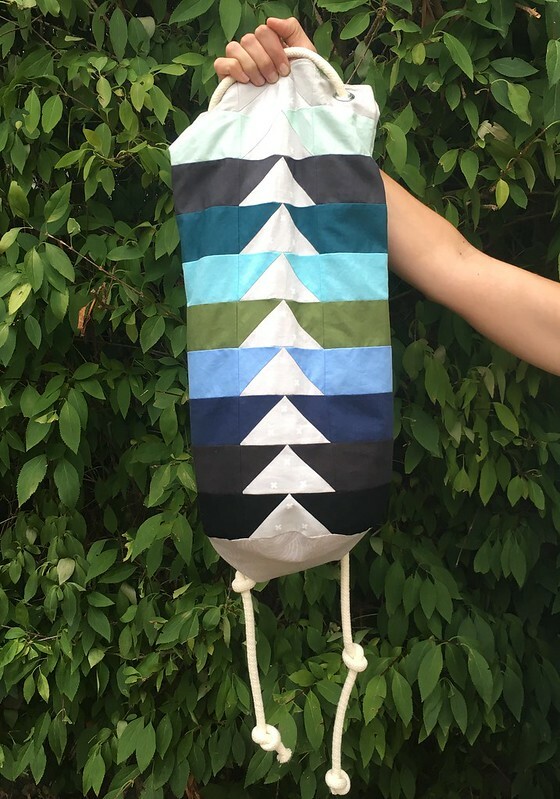 I almost dipped a toe in years ago, before I sewed regularly, when I bought an Amy Butler diaper bag pattern, but I think it was one of those aspirational projects where you buy the supplies, tell yourself you’re going to do it, but know in your heart that you never really will. Thankfully my best friend saved me from that whole scenario by making the bag for me. Otherwise I guarantee it would still be sitting in my box of patterns, unmade. So, I mulled it over, and finally decided to go for it. With help from Maggie at Pintuck & Purl (We all knew that’s where I was going for supplies, right? ), I picked out fabric in colors that would be neutrals for me, with a little bit of a surprise on the inside. 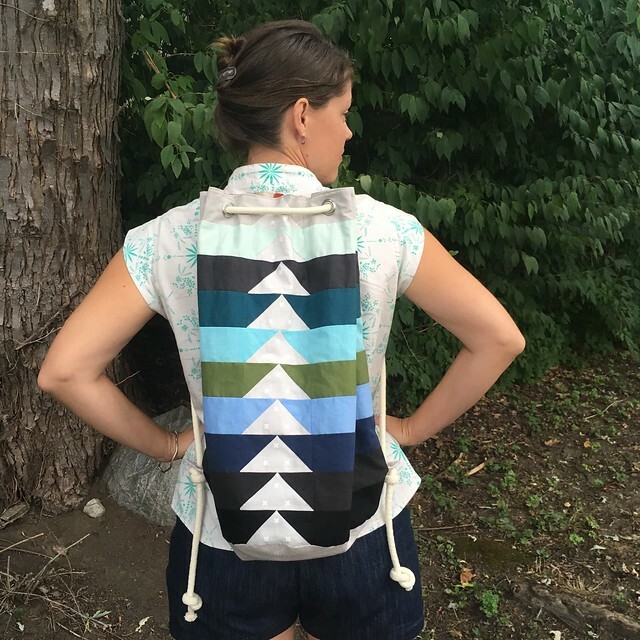 I found all the directions to make the bag on the Bernina blog. 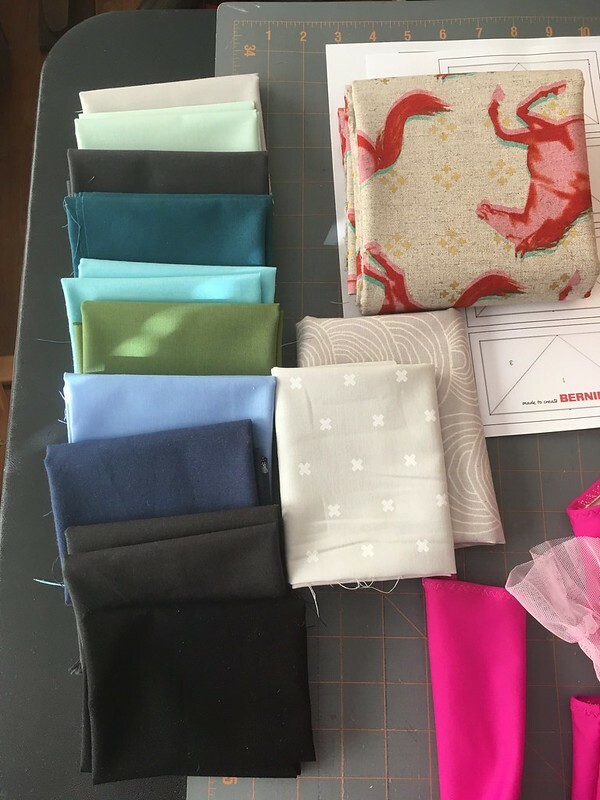 Even if you don’t own a Bernina sewing machine (I don’t), this blog has a lot of good information. As an apparel sewer, it took me a little while to get my head around the quilting concepts, but I got there. I realized as I went along that my creation wasn’t going to be “perfect”, so I made the important decision to *mostly* let that go. I couldn’t get bogged down in perfectionism if I ever wanted to finish. And guess what? Once I moved on and actually finished the bag, I didn’t even think about the parts that had struck me as imperfect while I was making it. I was a little skeptical about using quarter-inch seams in a bag that would have to take weight. 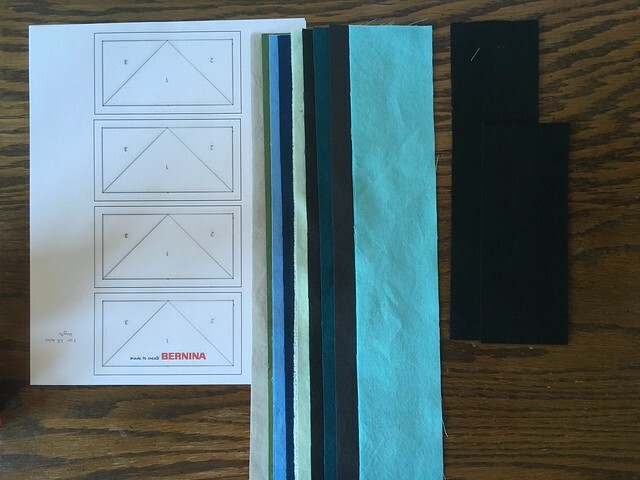 I know 1/4″ seams are common in quilting. I’m curious about what is standard in bag-making. Is there a standard? Is it 5/8″ like in apparel? One inch? Something completely different? 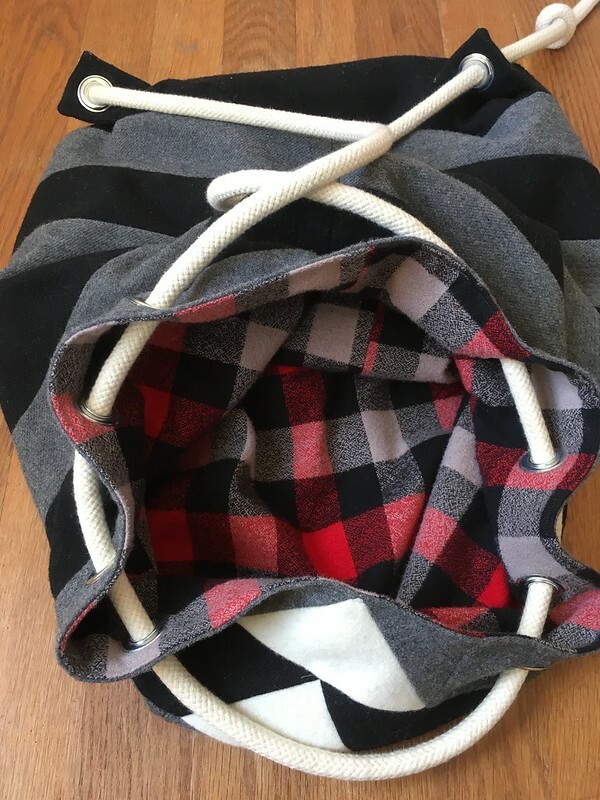 Either way, as my husband pointed out, the lining could carry a lot of the weight, and that wasn’t pieced beyond attaching the bottom to the body of the lining. I like security, so I double stitched the bottoms onto both the inside and the outside for extra security, and it’s never given me any problems. 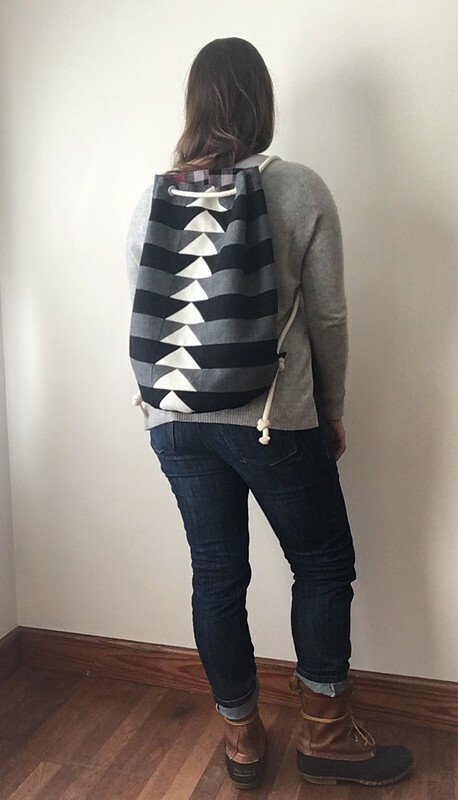 In fact, I’ve used this bag every day since I made it. I felt a little disloyal to my old beloved bag that I had been using, but I haven’t had any sore shoulders due to heavy bags since I switched. 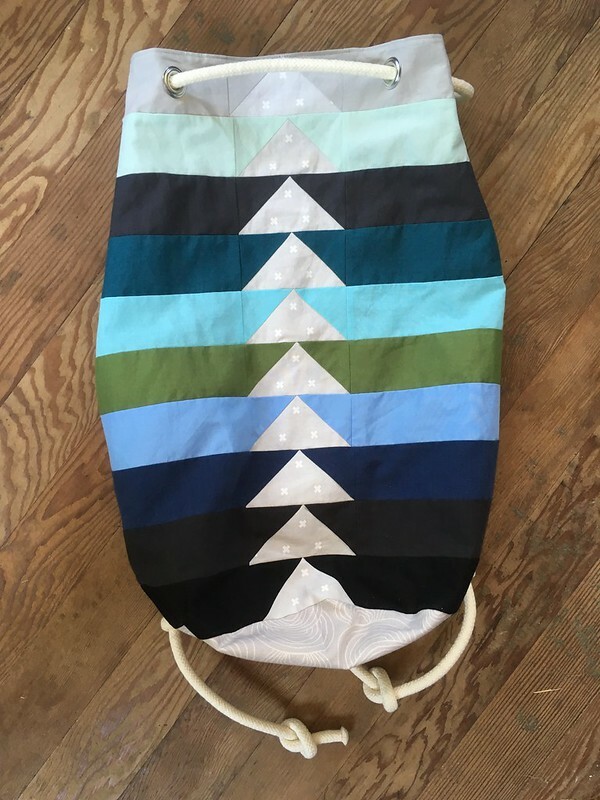 I love this bag, and I liked dipping my toe into quilting techniques without having to make a full quilt. It was just enough. But you know what? I love apparel even more. I don’t think I’m going to become a bag-maker any time soon, but I’m glad I tried because now I know I can do it. 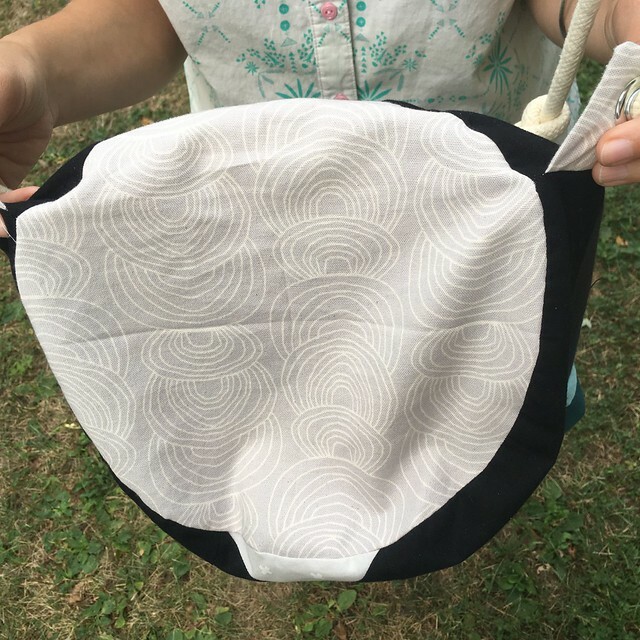 I can learn quilting techniques and, if I want to, I can also learn to make any bag that strikes my fancy. 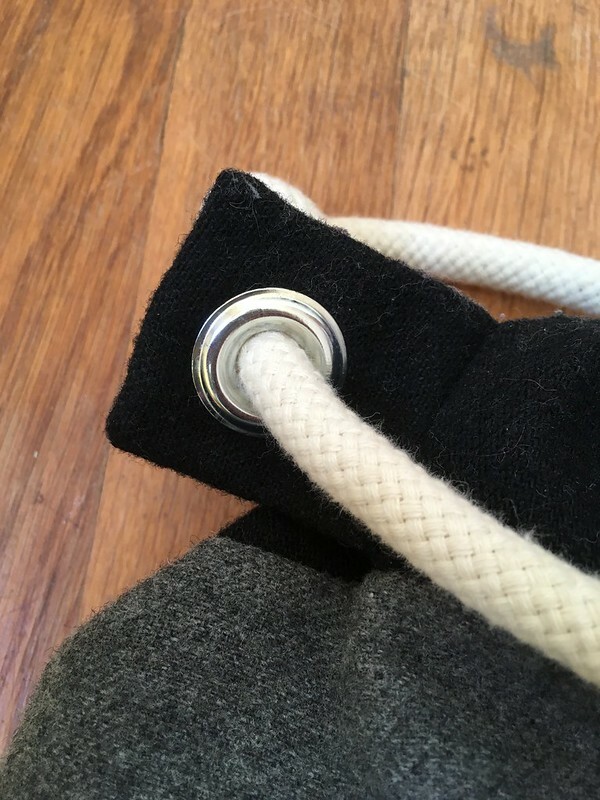 My grommets and rope were purchased at Jo-Ann Fabrics. I was feeling pretty good at the end of this photo shoot. 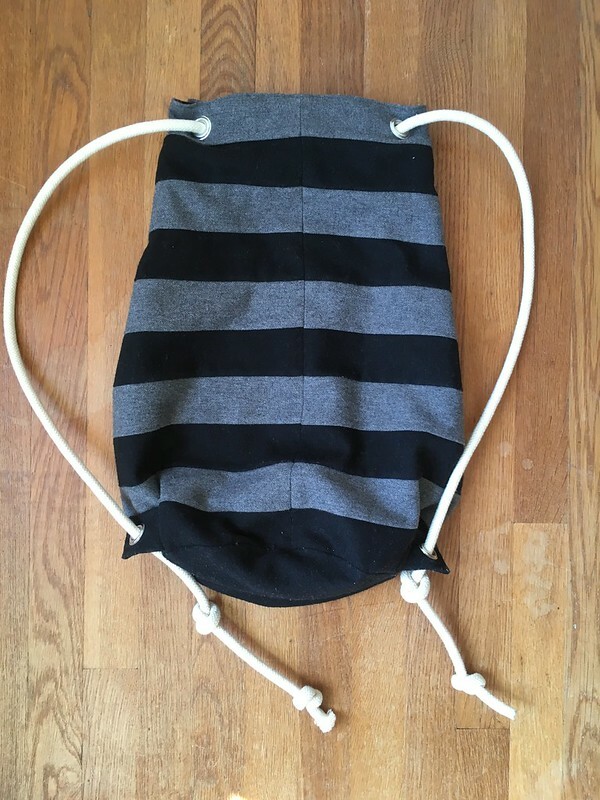 I made my shirt, shorts, AND bag! I love sewing! Lately I’ve been listening to C.S. Lewis’ Space Trilogy on audiobook. I’m currently listening to Perelandra, the second book and probably my favorite of the three. C.S. Lewis always makes me rethink ideas and see things in new ways. My Refashioners 2016 skirt was nominated for the Best Skirt Refashion in the Summer Skirt Awards for 2016 on the Skirt Fixation blog. Thanks! I love following @wingandaprayerfarm on Instagram. Tammy White gives you a look into her farm in Vermont that is at once honest, loving, and beautiful. How about a little ‘Mesmerizing Mass Sheep Herding’ to start your fall off right?